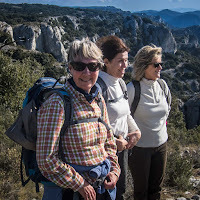 This walk from la Font de l'Orme (Merindol) has been my favourite walk in the Luberon since the 1990's. You reach Pic de Faiendre (598m) in just 1h 15min from the car and continue all the way to the Petite Luberon Ridge (an old Vadois route). From Bastidon du Pradon you take the most impressive descent down from Luberon anywhere (along Serre Long) and you end up getting a little "tast" of the Gorges de Regalon at the bottom, on the way back to the car. For full walk description: See my blog. 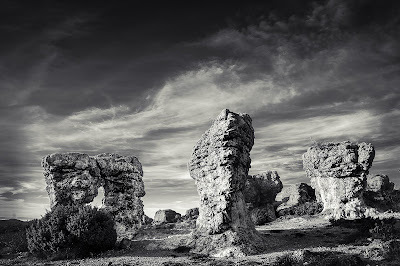 Just 2 km north of the medieval town of Forcalquir are the gigantic rock formations called Les Mourres. The site was a traditional, ceremonial and nocturnal meeting place for sorcerers and sorceresses to dance naked at the full moon. 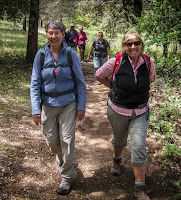 We were focusing on the Vallee de Claree (Navache) this year, and the Friday walk went from the parking at Laval towards Mount Thabor. Got as far as Col des Muandes (2828m) where a signpost said another 1 hour to Tabor. That's for next year. We did the main walk on the Saturday, also from Laval. A long round trip (8,5h), starting with Col des Beraudes (ca. 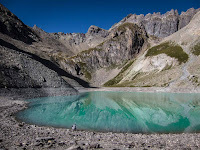 2900m - 2,5h straight up), then Col de Ponsonniere (2613) and finally Col des Cerces (2574m). Finished off with a walk on Grand Area (2869m) on the Sunday, returning along the "back" of the mountain, probably for the last time (getting difficult). 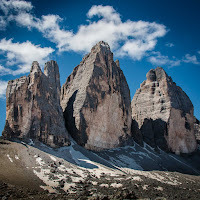 The Dolomites are parts of the Italien Alps. We stayed in Cortina d'Ampeza, just 2 hours drive north of Venice and in Arabba, an hour further west. The summer lifts starts earlier than we are used to in the French Alps (June), but the hazard of too much snow in high altitudes and in shaded valleys is the same. Stopped in Bardolino on the shores of Lake Garda for a night before driving back to Cucuron. Press the "i" for info if you want to see where a photo is taken. This has become pretty much a standard walk from Nans-les-Pins, where the main attraction is the river Huveaune's first kilometer down stream from its source. Best conditions in April/May. England – Midlands and the East Coast. 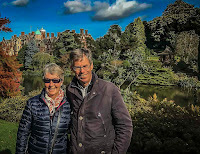 A very pleasant 4-day stay in October with Judith and Vernon in Northampton resulted in sightseeing also along a bit of the East Coast of England (Blakeney to Sandringham), including Cambridge on the way.